Is Tupperware Safe to Use For My Kids' Lunches? Is Tupperware Safe to Use For My Kids’ Lunches? There are so many factors to consider when packing your child’s lunch. Is it nutritious? Is it filling? Will it stay as hot or cold as it should until lunch time? But here is a question many parents may not consider asking themselves: is that plastic container the lunch is being packed in actually safe? Contrary to what many believe, plastic containers can give off substances that are harmful to your child, even if those plastic containers are made with materials that have been approved by government health organizations. Here are five reasons to consider switching from using plastic containers, which may increase health risks to your children, to packing your children’s lunches in stainless steel bento lunch boxes instead. Tupperware-style plastic containers were first developed in 1946. They gained popularity several years later, when the first Tupperware Home Party was held to demonstrate how the products could be used, and have remained a staple in American kitchens since then. Many companies have developed similarly effective plastic container systems, which often have the benefit of storing food much easier than using alternatives, such as foil wrap. However, many consumers are unaware of the dangerous plastics which with Tupperware and similar plastic containers are made. They may contain BPA, PET, HDPE, PVC, and PP, all of which can leak carcinogenic or hormone-disrupting substances into food. Polyethylene terephthalate, or PET plastics, are most commonly found in water bottles. According to research, bottles made with this type of plastic may leach surprisingly high levels of estrogen hormones into the water. Inadvertently drinking extra estrogen can have dangerous health effects. For example, it can result in fat gain and water retention or bloating. In girls, it may cause particularly intense PMS symptoms, such as mood swings and cramping, due to the imbalanced hormones. Choosing to use reusable metal water bottles can reduce the risk of developing serious health risks related to PET plastic. 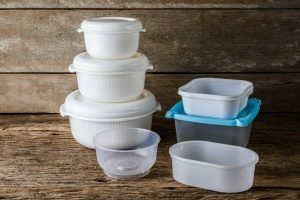 HDPE, or high-density polyethylene, is a tough, strong plastic that is often used for microwave-safe containers, as it can withstand higher temperatures than most other plastics. It can also be found in milk, juice, and shampoo bottles, as well as grocery bags and cereal box liners. This type of plastic is generally considered to be safe because of its non-reactive qualities. However, this may not be the case, and HDPE may actually leach harmful chemicals. Like PET, it can deliver estrogenic chemicals that are dangerous to children. These chemicals can cause damage to the reproductive system and disrupt their hormone balance, causing problems with moods and development. If the term “PVC” (polyvinyl chloride) sounds familiar, that’s because this type of plastic is everywhere. It can be found in pipes, lunchboxes, pencil bags, binders, inflatable pool toys, air mattresses, and even teething toys, among other items, and is especially prevalent in items designed for children due to its durability. However, PVC may be one of the most hazardous plastic compounds. It has a heavy chlorine content, which means that it can release dioxins when heated. Dioxins may cause developmental and reproductive health issues by interfering with the endocrine system and its hormones. Exposure to PVC dust may also cause asthma or otherwise affect the lungs and a child’s ability to breathe. In July 2005, the European Parliament banned the use of PVC to make toys, and it is not recyclable due in part to its toxic qualities. It is not yet banned in the United States. PP, or polypropylene, is commonly found in disposable diapers, disposable food containers, sanitary pads, and kitchen items, such as cups and bottles. This type of plastic was previously thought to be safe. However, it has been recently discovered that PP may leach quaternary ammonium biocides, which are added to plastics in order to give them anti-bacterial properties, and oleamide. Both of these chemicals can cause damage to enzymes and brain receptors. Antimicrobial additives are being used more and more often in plastic products nowadays, making them more difficult to avoid. As a result, it may be helpful to families to use organic and metal products instead. Bisphenol A, more easily recognized as BPA, is perhaps one of the most widely-used plastics. It is used to make water bottles, can linings, and baby bottles, among other items. These items can leak estrogen compounds, which may cause hormonal imbalances, when heated. BPA plastic may also increase the growth of fibroid tumors and lead to the development of diabetes and heart conditions. Products made with BPA are typically made of transparent clear or colored plastic and marked with a number 7 on the bottom. These containers should never be microwaved, used to store heated liquids or foods, or washed with hot water, as the heat can increase the rate at which chemicals seep through the plastic and into food. PS, or polystyrene, goes by another name: Styrofoam. It is made of petroleum byproducts and can be found in foam containers of all kinds, as well as in plastic cutlery. PS is difficult to recycle and has been known to leach styrene, a possible neurotoxin. Fatty foods, such as meat and cheese, are particularly susceptible to absorbing styrene. Families can protect themselves against this chemical by bringing their own glass or metal containers in which to store leftovers. Families whom are concerned about the negative effects of these plastics have several options. They could familiarize themselves with the markings used on products to denote these plastics, and avoid purchasing them whenever possible. However, checking each individual item can be a tedious process. It may therefore be more cost- and time-efficient to avoid plastics altogether. 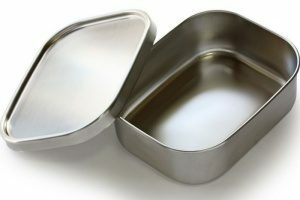 Kangovou’s bento lunch boxes are made of stainless steel and are therefore free of harmful chemicals. Bento lunch boxes take up less space in cabinets and backpacks alike and are capable of helping foods retain their temperatures. Thanks to the adjustable dividers, they can also be used to maintain portion control and create more nutritious meals. Bento lunch boxes are a safe, easy-to-use alternative to more traditional plastic containers that can keep your children — and their food — safe from plastic chemicals.